Drum machines, from Ace Tone to Yamaha: The site KB6.de has an obscenely large collection of drum sets from most of the popular drum machines over the years. They’re raw samples, and you definitely get more of an all-around package from commercial sets, but if you just want some free samples, it looks like a good place to start. Donations encouraged to cover bandwidth costs. Free stuff from Goldbaby: CDM reader Hugo of Goldbaby sends his treasure trove of free soundware. 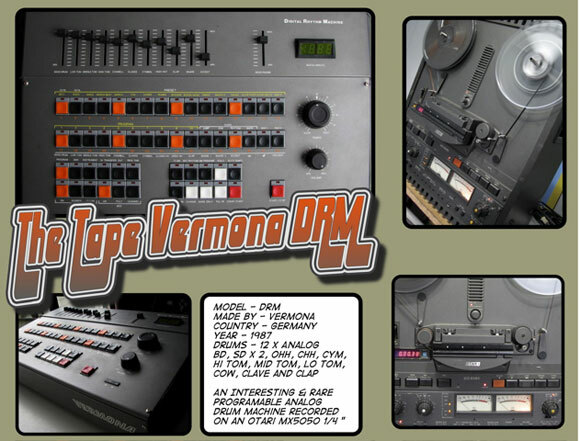 The latest addition: an analog tape-sampled recording of the rare 1987 German Vermona DRM machine. To celebrate the release of our new product (Tape Drum Machines Vol 1) we have created a free sample pack called: TheTapeVeronaDRM. Contains 142 x 24 bit samples of the Vermona DRM. Recorded on an Otari MX5050 1/4 inch tape machine… plus the original drum hits without any tape love as well. Each drum sound has also been recorded multiple times for use in Round Robin Layering. This can help recreate the analog feel of the machine. Some really nice and unusual stuff there. we just published a new sample-package of more than 120 mbyte containing 174 individual and unique, FREEWARE bassline-glitchnoize-loops for idm/mimimal-nerds.